With there being lots of festivals on at the moment in the UK, I thought I would share some essential beauty products for festivals. These products would also be great for holidays too. 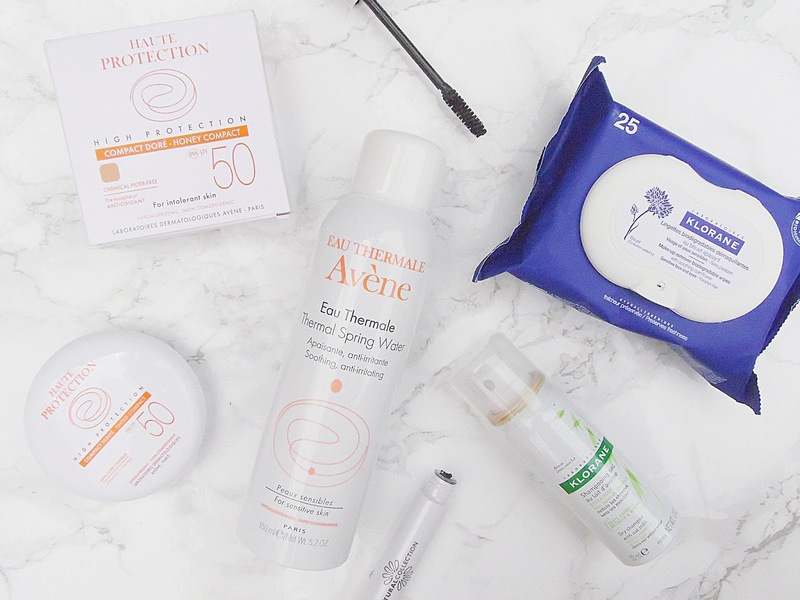 If you are going to a festival this summer it is so important to keep your skin in check and well protected and these products will do just that! The biggest festival essentials are SPF and some form of wipe whether it be face wipes or baby wipes. The wipes I have been really enjoying at the moment are the Klorane Soothing Make-Up Removal Wipes (£7.50). These wipes do a pretty good job at removing makeup and at a festival you aren't going to be able to do a double cleanse so these are going to get you through the weekend! These wipes are 100% biodegradable, alcohol, and fragrance free. These wipes are great for removing face glitter and over the top eye makeup (which I personally love at a festival) so you won't have to scrub at your face to remove your makeup at night - or early in the morning! For SPF I would recommend something with a high protection as I always end up getting burnt at a festival so learn from my mistakes. The Avene SPF 50 High Protection Honey Compact (£24) is a great SPF for the face as it has a light coverage too while offering very high UVA and UVB protection. At a festival chances are you aren't going to be able to give your hair a decent wash (or at all) so meet your new best friend - dry shampoo! The Klorane Dry Shampoo with Oat Milk (£4) is going to keep your hair feeling clean and will add a tonne of volume. This dry shampoo is to be sprayed into the hair and left for two minutes before brushing out. I find that this dry shampoo doesn't dry out my hair or leave it feeling full of residue. I have almost black hair and this dry shampoo surprised me as it didn't leave a grey cast behind once I brushed it out. I don't know about you but I get extremely hot and sticky at a festival so I always need to use a good waterproof mascara that I know won't melt off or get rained off - you know how England is! This one from Natural Collection, a bargain at £1.99, it does a great job at keeping my lashes looking long and thickened while lasting all day without budging! And last but not least is the Avene Thermal Spring Water (50ml is £3). This is a water mist which is perfect for refreshing the skin and for when it is feeling tight and uncomfortable. This also has soothing properties so if you do happen to get sun burnt this will help your skin feel better!